“Don’t break my heart. My achy breaky heart...” The château manager turns down Billy Ray Cyrus as his BMW swings into the château courtyard and his eyes set upon a scene straight out of the apocalyptic climax of Sharknado 3. Staff are screaming and running around in panic. He looks up into the sky. No tornado. No sharks. Hm...it must be a root day. His secretary, mascara streaming down her cheeks, bangs on the driver window. Should he wind it down? Whatever words come out of her mouth are going to ruin his day. He racks his brain. Frost. Frost. Frost? He’s heard about it somewhere. Isn’t it some viral disease that only affects Burgundy? His stomach lurches. He grabs a copy of the Oxford Encyclopedia of Wine, rips off the cellophane and looks under “F” just as the telephone rings. It is the Cayman Island-based billionaire owner, yet to deign the property with his sun-tanned presence. Things have not been going well. His boss’s first idea had been to sell the 2016 vintage using Bitcoin, which backfired when an overnight plunge rendered it worth about a dollar per bottle, still approximately 100 cents more than most are willing to pay for Sauternes. His second move had been to lobby the EU to make “Bordeaux Bashing illegal” under the Human Rights Act and then make a promotional video on sexual confusion narrated by Kevin Spacey. The château manager pictures “Rudolf” and “Steiner”, prancing through the vines like enslaved My Little Ponies during last year’s campaign, sent trotting to the abattoir as soon as the last journalist had left. Ping! It’s a new message from his vineyard manager that reads in stress-inducing capitals: “BLACK FROST”. The seriousness of the situation is indicated by three sad emojis...and an ice cream. Presumably his finger slipped onto the wrong emoticon. Black is bad. Black Death. Black Sabbath. Blackpool. Black frost? Why can’t it be rainbow frost - sounds less serious. The phone rings again. It’s über-famous consultant. His last pearl of wisdom was to buy amphora because apparently it is now impossible to make Claret without them. To save money he ordered half-a-dozen from Amazon and sure enough, a container of used plant pots arrived the following day. Phone beeps. That pesky blogger has put a bloody selfie on Instagram, posing next to a forlorn blackened vine with a proclamation of a “2017 D.O.A.” to his six followers. That’s it. That’s enough. His heart is achy and breaky. To console his sorrows he raids the château’s private reserve and cracks open a 1961 and dreams of a frost-free vintage, just like that one. • Late spring frost affected Bordeaux, but spared the great terroirs on Left and Right Bank. • Good flowering followed by warm June and a cooler, less sunny July and August. • Relatively early harvest after early September rain. Most reds picked in the second half of September in good conditions. This summary of the growing season is based around the annual report by Bill Blatch and that of Professor Laurence Geny and Dr. Alex Marchal at the Oenological Research Unit at University of Bordeaux, which was authored by the late Denis Dubourdieu for many years. Once the first draft is written, I weave in information from numerous tête-à-têtes with winemakers plus personal observations gleaned from visits throughout the year. Finally, I whisk in a couple of jokes and wry asides as Easter eggs for those that read the whole bloomin’ thing. Those wishing to skip this part can read the bullet points above. But if you want to understand some of the minutiae of the growing season and how particularly meteorological events sculpted the 2017s, some more discrete than others, then read on. Whilst it feels natural to examine a growing season tout seul, in reality the temporal influence upon the vintage extends beyond bud-break or 1 January. The purview should include the previous season and beyond. Think of it like a meteorological solera: the further back you go, the more negligible the influence, but an influence all the same. For example, consider how the water table depends not only on the rainfall that season, but also the preceding seasons. In this respect, just consider that 2017 followed two comparatively dry growing seasons that produced a flurry of great wines. The 2016/2017 winter months were relatively warm as a high pressure system wedged itself over France, so that December average temperatures were 2.2° Celsius above normal. Vines are like tortoises insofar that need to go into stand-by mode and rest during winter months and a warm December precluded them from doing so, at least until a fortnight of freezing weather in January. This was crucial for killing off pests and diseases and simply gave them a much-needed nap. Come February and March, winter appeared cancelled or as it transpired, postponed, as temperatures rose 2.5° and 2.9° Celsius above average respectively. January had been the driest for 25 years, a month when usually water reserves are topped up, the first important factor given the low precipitation later that year. All this meant that vineyard managers had an early start to the growth cycle, almost the opposite to the inchoate 2018 when the vines still looked dormant by early April. 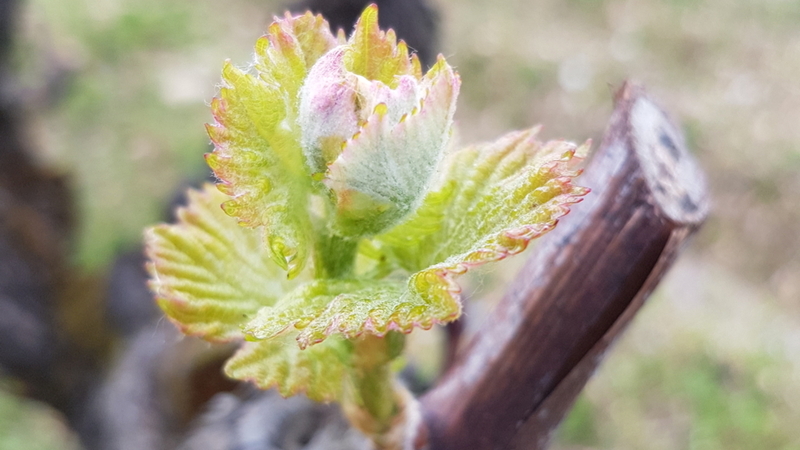 Theoretically, bud-burst could have been early March but perhaps due to the tacit influence of the previous season’s drought, the vines did not switch the ignition until mid-March and then sprinted ahead so that the baby leaves were unfurling by the end of the month. Average bud-break was 28 March and like many, I recall vineyards exploding into green during en primeur last year. Growers already speculated upon an early harvest, putting them in positive frame of mind since they prefer an early start. At that time, some touted 2014, 2015 and 2016 as a modern-day 1988, 1989 and 1990 as part of last year’s promotional campaign, to which I rejoined that 2017 is destined to be 1991 and they’ll be frosted over. You can get away with these jibes when you’ve known winemakers for a long time. They just grinned. They know my black humor. What are the odds? “Quite high” in fact. Whilst doubtless at the back of their minds winemakers were wary of frost, in reality many cannot remember 1991, when frost extirpated vast swathes of Bordeaux. It makes me feel old writing this, but middle-aged winemakers now in their early forties were at school in 1991. The succession of frost-free springs perhaps misled some to believe that global warming made Bordeaux immune to widespread late frost. That was a thing of the past. It only happened in another world...like Volnay or Pommard. Sure, there were skirmishes in 1997, 2009 and 2011, but not enough for properties to invest in wind-turbines or candles as those in more frost-prone northerly latitudes do in Chablis or Alsace for instance, or at least those with financial means. That said, I always spied the turbines in Domaine de Chevalier or just outside L’Eglise-Clinet towards the church, always stationary and wondering if they would ever be used. It looked unlikely in 2017. By mid-April, warm weather meant that the shoots were some 30cm in length with six to eight leaves. As one winemaker joked back then, they could be picking before they decamped to Cap Feret that summer. I took this photograph on 31 March at Yquem. If only that bud knew what was in store. In all likelihood this would have been one of the survivors. Then everything changed. From 20 April, the first wave of frost devastated several regions, including Chablis and Champagne. Bordeaux escaped relatively unscathed with just some vineyards in Saint-Émilion reporting a 10% loss, the extremely dry conditions limiting the damage. That changed on 24 and 25 April after a spell of rain drifted up from Spain. Then on the night of 26 April, the wind and temperatures dropped in tandem. In a majority of areas the temperature plunged to -2° Celsius and in some places the mercury fell to -5° or -6° Celsius, low enough to vanquish all hope. To pile on the agony, the frost attacked on not just one, but three consecutive nights. 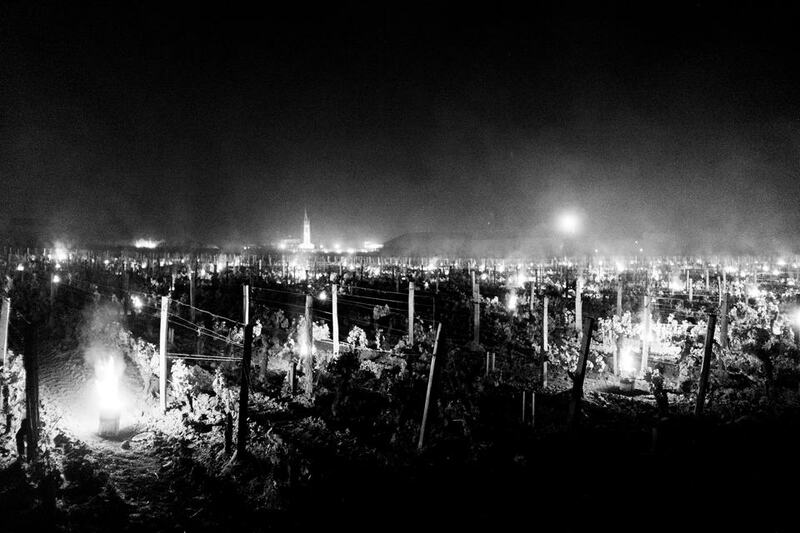 Several vineyard managers remarked that the second and third nights inflicted the most damage. Factor in the sun’s rays burning the buds as the light passed through the prism of ice, à la Burgundy, well, a festering sense of dread was palpable. As I have written before with respect to the Côte d’Or in 2016, the extent and severity of frost damage is not immediately visible. It is during the following day that the verdant canopy discolors into ugly browns or blacks. In fact, Baptiste Guinaudeau at Lafleur remarked on what he termed as a “grey” frost inasmuch that the aftereffects can be longer-lasting and less obvious, a corruption in the physiology of the vine, symptomatic by a defect in flowering or distorted growth that is only apparent with time. There is a great quote I must credit to Will Hargrove at Corney & Barrow who described the Bordeaux frost as a “snob”. He refers to the fact that unlike in 1991, frost damage was not passim. It spared the Grand Cru Classés whose vines lie within the ambit of the temperature-regulating turbid waters of the Gironde. Give or take the odd anomaly, but the rule is the closer to the estuary, the safer you were. During my first week visiting the Grand Cru Classés on the Left Bank, it was clear that nary a vine was touched by frost, though it became more evident as I ventured to more inland vineyards in Saint-Julien and then down to Margaux. Likewise, on the Right Bank, the Pomerol gravel plateau and Saint-Émilion limestone plateau and the côtes got away unscathed whereas lower lying areas on the plane were often severely impacted. This is why unlike in 1956 or 1991 hardly any major names are missing from the roll call of forthcoming releases, the most high profile casualties: d’Angludet, de Fieuzal, La Pointe and Climens. In his annual report, Bill Blatch describes a swathe of damage that extended from Blaye down to Barsac. Entre-Deux-Mers was acutely affected with 50 to 100% damage, Lalande de Pomerol 50 to 80%, low lying Saint-Émilion around 50%, low lying Graves 50 to 80% and Barsac 60 to 100%. From that list, it is clear that this “snobby” frost aimed its icy wrath on those most vulnerable, properties that can ill-afford to skip a harvest. The BIVB reported a potential loss of 40% of production, equivalent to 30 million bottles, but much of that is centered on the unfamiliar names selling their wines either for a handful of euros or in bulk. Many cannot afford the arsenal of counter-measures available to the top estates, though of course, much depended on how pro-active you were. I give you one comparison. Though in different communes, the vines of La Conseillante and Cheval Blanc are neighbors. At La Conseillante it was all hands to the deck. Winemaker Marielle Cazaux had an hour to learn how to fly a helicopter so that its downdraft would blow away the mass of cold air (OK, she didn’t...but I like to imagine she did). Proprietor Valmy Nicolas was not the only one to tell me this was the most effective means of raising the temperature sufficiently to protect nearly all but 15% of peripheral vines from frost damage. Then again, few can afford to take that measure and let’s not get into the subject of air control restrictions. Next door at Cheval Blanc, 66% of their vineyard was damaged by frost. It is not as if the topography of the two vineyards are completely different. Cheval Blanc does not lie downhill or in a gully. The stark difference must surely come from the timeliness and extent of remedial action. In the end, La Conseillante enjoyed a fairly normal yield whilst Cheval Blanc produced less than half since they opted to discard nearly all the second generation fruit from the affected vines (and fortunately, still made a good wine). The frost set three different vintages in motion. Those that faced zero production, those partially affected and lucky ones completely unaffected. Those facing 100% loss found that the frost had killed the counter-buds. Frost had not only ripped their main parachute but ripped the emergency parachute as well. Game over. Pray that 2018 is kinder and get your vines in ship-shape for the next season. Those partially affected had surviving first generation growth intermixed with counter-buds that would produce second-generation fruit. The problem is that the rest of the growing season needs to be warm and dry so that the fruit, lagging behind in terms of the vegetative cycle, can make-up the lost time and get within touching distance of phenolic ripeness come harvest. That necessitates a lot of effort by the vine and vineyard hands since they had best marked the vines using secondary fruit so that pickers could separate them come harvest time. The problem was that damaged vines were scattered hither and thither, so it is vital to do this as soon as possible because eventually the bunches look identical but with very different ripeness levels. Again, that takes time and money, though as you will read from my individual château write-ups, nearly all the major estates had the manpower and willingness to do this. Those estates that had got away Scott free could just send the sympathy cards. As it transpired some enjoyed bountiful crops; galling for those with silent harvest receptions and empty vats. So, what did happen weather-wise? May was hot and warm with heat spikes over 30° Celsius. Mi-fleuraison was on 30 May, around two weeks earlier than normal and flowering itself was spread over 10 days in almost perfect conditions. Eric Kohler at Lafite-Rothschild described it as the best he had ever seen. It was rubbing salt in the wounds of those who faced the prospect of a tiny or no harvest at all. Then June was baking hot with temperatures 5.5° Celsius above average, the third hottest since 1959 and not far from 2003. It was especially warm during Vinexpo week. I remember chatting with actress Salma Hayek outside Latour late one balmy night, feeling stiflingly hot in my tuxedo. (Apologies, I have to namedrop because I am never going to be able to write that again and, for the record, I was hot because of the outside temperature and not because of who I was talking to). At this point, maybe, just maybe, if conditions prevailed then the second-generation fruit might catch up, just like it did in 1961, ergo the reference in my opening preamble in case you missed it. Just after I left Bordeaux, when Salma was pondering what might had been if she met me before François Pinault, the heavens opened and rain fell at the end of June, around 100mm. It was enough to get the vines motoring again, however July was relatively cool despite a couple of heat spikes. Average temperatures (26.4° Celsius) are deceptive since warm nights raised that figure. It was also dry, around 28mm of rain on average, which caused some vines, especially younger ones with shallower roots or those on more free-draining gravel soils, to suffer heat stress. Importantly, the sunshine hours were 189 instead of an average of 249. 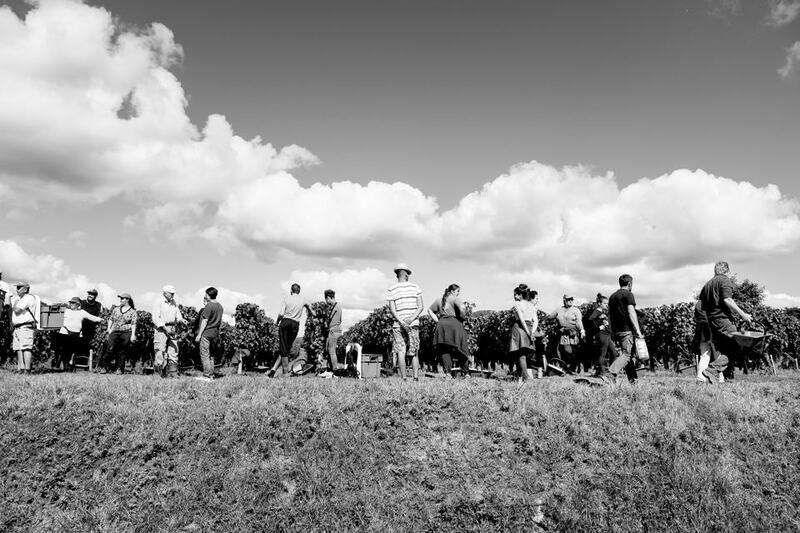 Véraison took place around 20 July and those frost-free vines looked forward to an early harvest, whilst those affected by frost suffered irregular ripening, hampering prospects of supplementing shortfalls of first generation fruit. There is one important point to make, one that influences the style of the 2017s. One of Denis Dubourdieu’s five governing conditions for a great vintage is that water stress must be observed “no later than the beginning of véraison”, referring to that liminal point when water stress retards vegetative growth and the vine redirects its energy into bunch formation. However, in 2017 was mostly observed after véraison, apart from those located on most well drained soils i.e. gravel croupes, which partly explains why the eventual wines do not possess the same flesh, sweetness and complexity of the previous two vintages. This is not applicable for all cases. For example, Dominique Arangoïts at Cos d’Estournel was one of several who observed hydric stress from mid-June. August continued the pattern of July. It was dry, just 30mm of rain, but at least there were more sunshine hours at 263 instead of a 241 hours average. However, temperatures languished in the low twenties until 21 August. It was only at the end of the month that temperatures increased to the extent that it skewed average temperature figure of 28° Celsius compared to a 21.7° Celsius average. To me, this cool period in August influences the style of the 2017s and maybe overlooked by more dramatic events such as the April frost or early September downpours. It capped ripeness levels, denying even the healthiest vines to develop high sugar levels (something I will return to later on.) Whilst the build up of anthocyanins were not that different from 2016, there was less polyphenol content than previous years, in fact, the lowest since 2013 with respect to Cabernet Sauvignon. It set in place conditions that could produce very good wines, albeit in a more linear, slightly drier and slightly tannic style, which some might sum-up as “classic”. One benefit is that the cooler temperatures locked in the low pH levels and freshness evident in many of the 2017 samples and then heat at the end of August eradicated any pyrazines, so that there is very little greenness in this vintage. If the Bordelais could have written the script then September would have witnessed an Indian summer and everyone would have lived happily ever after. But the first half of the month was drizzly and overcast. Rainfall varies between communes depending who you speak to. Certainly, until 12 September up to 100-120mm of rain fell, a few millimeters each day rather than a burst of intense downpours, less on the Right Bank where figures are more in the region of 30 to 40mm. Of course, by this time picking had already started for the whites, as early as 21 August at Haut-Brion. By avoiding much of these early September rains, some of the dry white Bordeaux are exceptionally fine. In terms of the red grape varieties, the Merlot began to be picked from around 11 September since the spell of rain was coming to an end and there was always the risk of rot. Some growing season reports suggest that the Merlot did not deteriorate after the early September rain however this was not born out in conversation with growers. If you peruse many of the one-on-one discussions with Left Bank winemakers, they found that this rain diluted the quality of the Merlot and it subsequently compromised the final blend. So many, like Montrose and Calon-Ségur to name but two, de-selected vats of Merlot to create more Cabernet-leaning wines. The exception to this rule is the limestone and clay-limestone soils on the Saint-Emilion plateau, whereby the Merlot seems to have performed much better. Much of the Cabernet Sauvignon was picked from 22 or 23 September under fine and warm conditions. Again, if they could have written the script then the clement conditions would have continued into October and I feel that this might have led to more opulent, richer and more complex wines. However, the return of drizzle at the end of the month forced their hand and many expedited the harvest so that the secateurs were packed away by 29 September. There are a few that continued until the first days in October and so long as they fruit was carefully sorted it could contribute density and depth to the blend. Returning back to sugar levels, data shows that the average sugar level on 18 September was 217g/L compared to 223g/L in 2016. However, there is a large difference in total acidity, 3.7g/L in 2017 compared to 3.2g/L in 2016. Therefore, although sugar levels are not particularly low, the perception of sweetness is masked by that sharp acidity, determining one of the leitmotifs of the vintage. Although by harvest the vines hit by frost were only around 12 days behind those that were not, the fact is that in most cases, the vine had been unable to make up the aromatic and phenolic ripeness levels. Châteaux that had clung on to hope, had patiently sat it out and prayed for berries to ripen, finally threw in the towel. All that effort in marking individual vines, in the case of Lagrange some 250,000 of them, and subsequently tending them throughout the season, was to no avail. The only beneficiary was the distillery. Some châteaux did use the second-generation fruit with careful sorting, of course, mandatory for properties that could ill-afford a shortfall in production. Comte Stephan von Neipperg (Canon-la-Gaffelière, Clos de l’Oratoire etc) took that strategy and though I applaud the risk, I felt that the wines could not disguise an under-ripe element, put into sharp relief by the La Mondotte, a gorgeous Saint-Emilion that had suffered no frost damage. Indeed, at the top level of the Bordeaux hierarchy nearly all properties simply eschewed all second-generation fruit if there was any. Yields were average and in some places high, for example, Beychevelle enjoying their biggest crop since 1999. Of course, as you go down the hierarchy you will find second generation fruit used more often. Estates did not possess the means to mark affected vines, conduct rigorous sorting or face a seriously depleted vintage. The frost essentially concentrated quality on the best terroirs and the most famous names, leaving the rest to fend for themselves. By coincidence, Johan Berglund was on the Right Bank when the frost struck. Here you see burners or “candles” lit in Clos l’Eglise in Pomerol. You can see the l’église de Pomerol in the background. Most properties that were either unaffected by frost or elected not to use frost-affected vines, reported a healthy crop entering the reception area. Vibrating tables, Tribaie, optical sorting machines and good old human eyes and hands did their job, but it was not a year where a high percentage had to be discarded since there was little rot. Those electing to weed out second-generation fruit did so in the vineyard, rather than risk sorting at the last moment before entering the vat. Alcoholic fermentation was normal. Quite a number of properties eschew SO2 to protect the fruit at this stage, partly because nowadays the fruit is so healthy after fastidious sorting. There are also one or two, most notably Les Carmes Haut-Brion but also to a lesser degree at Smith Haut-Lafitte, that are welcoming stems into the vat. Stem addition is little seen in Bordeaux. Whilst it comes with risk, I am intrigued by the handful that do use it and so long as the stems are fully lignified, why not trying something different. One thing for sure is that nearly all properties were adamant that they had to conduct a soft, gentle and longer than normal extraction, often rebranded as “infusion”. You will find this repeated throughout the interviews. This is partly down to a revised view of desirable wine that focuses on elegance and less power/alcohol compared to a decade ago, also to make the wines less tannic and more approachable in their youth. In addition, some winemakers were smitten by the aromas during fermentation and wanted to capture that in the finished wine. At the properties I visited, none reported difficult filling vats with depleted volumes of must. This is probably because so many have installed smaller vats or followed Burgundy and ferment the wine in barrel (though I am not the biggest fan of vinification integrale in Bordeaux.) I imagine that filling vats might be more problematic in frost-affected vineyards equipped with large wooden or concrete vats, though I did not witness that myself. Levels of new oak have clearly fallen in recent years although they appear to have leveled out nowadays. As I referenced in my preamble, the current rage is for clay amphora to varying degrees. To be frank, I remain unconvinced by their role in Bordeaux, often more a fashion statement than a vessel that truly enhances wine. Of course, that does not preclude a Bordeaux winery that employs amphora from making a very good wine – I just remain to be convinced about the benefits in terms of quality. The malolactics and blending were done in some cases before Christmas and in others in early January, many preferring to get this done sooner rather than later so that the wine is more settled by the time of en primeur, which is where we are now. The same as always. The same hotels. The same basic itinerary. The same three-week duration. With the same photographer, Johan Berglund, whose stunning images adorn this report. There are two points that need to be emphasized. Firstly, there is no collusion, exchange of views, swapping of scores with Antonio. Our two reports are completely independent. Secondly, the tastings were a few days later than normal since the UGC moved en primeur week to avoid the late Easter break. This did make a difference in terms of wines enjoying a slightly longer rest period after malolactic and blending. Finally, as usual, wines were tasted as many times as possible – two, three, four even five times in some cases. This includes the First Growths. This is crucial in being able to verify observations and connect the dots. I try as much as possible not to base my note on a single tasting within time constraints. It was one of the wettest and gloomiest en primeur I can remember since I began. Winemakers obsessed about the weather, complaining they had not seen the sun since November. “Well, some people in Manchester haven’t seen the sun since November 1947,” I retorted. In my opinion, clouds and rain affects the taster’s frame of mind rather than the wine. My notes do not differ significantly between those written in rainy and sunny conditions. What does effect the samples is the length of time from blending and not the weather per se, but atmospheric pressure. Last but not least, a cause célèbre that I have stated many times: I am vehemently opposed to tasting unfinished wines blind. To know where a wine might go, you must know its background. You must know the particulars of the sample you are tasting. You must know details of its barrel maturation. Period. Nobody is exempt. Some samples are approximations of finished blends. Some come from a used barrel but will include new oak. Others come from a new barrel and will contain used oak. Some contain the vin de presse and others do not. You need to have that information on hand when giving your readership guidance and to that end, I asked every person I visited how and when samples were assembled and readers can see instances within the notes. Any sample more than three days old was rejected and you would be amazed how many were several days old. This is where experience kicks in, to use intuition when a sample just does not feel right and check the date if you have to use your gut feeling to pick out wines that just don’t feel right and enquire if it is not stated on the bottle. So, my négociant tastings focused only on those who take immense care of the samples and the temperature they are served. After assessing 20 Bordeaux vintages from barrel, I have amassed a pretty deep context in which to judge unfinished samples, but I am also always learning. As a professional critic, you must listen to winemakers and absorb background information whilst politely ignoring the euphemism and spin that surrounds what is essentially a brilliantly run marketing campaign directed at merchants and journalists. My scores are not for self-promotion or to promote Vinous. They don’t care about the charm of the winemaker, the renown of an estate or its market value. They simply reflect my estimation of how a wine will perform in the future as judged solely by its showing in the wine-glass. Though some will deny it, a lot of en primeur tasting is based on gut feeling, which comes into play when you write about how are the wine will be, rather than what it is. ‘Tis the ineluctable clairvoyance of primeur! Whilst hullabaloo surrounds en primeur scores, they are the first snapshot of many. The real test is comparing barrel samples to finished wines and beyond. 1) The 2017 Bordeaux vintage is a good to very good vintage, but it is not close to 2015 or 2016 in all but a handful of cases. Some proprietors talked of a “2014-plus” which is pretty fair. To quote Christian Seely: “I think it is closer to 2014 than 2015 and 2016, but 2014 was the product of a cool summer and fantastic end of season, whereas this  had a cool summer with a difficult end of season.” That is the reality. 2) Frost damage affected quality only at lower levels of the hierarchy: inland vineyards on the Left Bank, on the plain in Saint-Émilion and lower reaches of Pomerol, especially in satellite appellations where second generation fruit was used. 3) It is not a Left or Right Bank vintage. Quality can be found on both banks although as I compiled and edited my notes, I confess a lot of affection for the Right Bank thanks to performances in Saint-Émilion. 4) On the Left Bank, the northern Médoc, Saint-Estèphe and Pauillac, appears to have done better than those more southerly, Saint-Julien and Margaux. 5) On the Right Bank, the limestone plateau and the côtes did particularly well, a combination of terroir and avoidance of frost damage setting them apart. 6) Sauternes shows good potential even if not within the top tier of quality compared to the best vintages over the last 15 years. 7) Stylistically? The bouquet is often perfumed, a facet of winemaking that has vastly improved in recent years thanks to fine-tuning techniques in the winery. The wines frequently have a floral element, violets but quite often, more iris-like scents. The 2017s boast plenty of freshness with crisp acidity, noticeable but not strong or grippy tannins, more black fruit compared to recent vintages. They are not dense or weighty wines and are often linear in style. Finishes are moderate in length, often with an estuarine/brine-like aftertaste. Thanks to tannin management they ought to be very approachable, though most have the structure to suggest medium-term ageing potential, peaking from 10 to 20 years. Only the very top wines will deserve seriously long-term ageing and, in any case, you may well have the 2015 and 2016s for that. But their freshness ought to see them repay bottle maturation. One or two sages opined they resemble the 1988 albeit with much finer tannins and purity, again a view with good foundations. 8) In banal terms, I like this vintage. I am not saying it is the best, but they were mostly a pleasure to taste and fascinating to learn about. At the time of this writing, releases have been sporadic with just Palmer, Valandraud and Haut-Batailley the big names out so far. Proprietors, courtiers and négoçiants await scores and I hopefully have assisted there. There is the annual susurrus from the UK trade about where prices need to be positioned for a successful campaign and this often reflects sentiments in the United States, albeit skewed by differences in exchange rate. This is a critical factor since it can instantly wipe out any ex-cellar price reduction depending on country. For example, gleaning posts on the Vinous forum, Palmer reduced the price by 20% compared to 2016 ex-négociant that translates as a 12% reduction for consumers in the US. It will differ elsewhere. The challenge facing merchants? How do you persuade customers to spend money on a new vintage when others are available more cheaply? In the case of 2017, it will inevitably be compared to 2014. Even though the wines are slightly better, the gap is not huge, not to mention that the 2014 is physically available. But speaking to merchants they would wish to see 2017s pegged closer to 2014 than a reduction on 2016. The reasons for buying wine en primeur have changed in the last 10 years and that change can be summed up in a single word: investment. Although Bordeaux has appreciated in value since the early 1980s, it was a monetary benefit to the niche of the population that enjoyed fine wine and probably reinvested in next year’s en primeur. Since Bordeaux has become a global luxury brand, at least at the top of the pyramid, wines have become commodities and treated thus. This encourages château to limit the percentage released onto the market the following Spring and négociants to do likewise, sitting on stock until they can realize their desired price or profit margin. It renders the distribution system opaque and I believe consumers should be informed of quantities released for sale when being encouraged to buy. With this in mind, I suspect that some châteaux will limit releases in 2017 in order to maintain that all-important price differential with competitors, a price point that fits in with the image they wish to convey, often one of luxury, aspiration and exclusivity. As I have written many times, this means that the top estates no longer have the flexibility of prices that ensures the en primeur machine is well-oiled. They are hemmed in by a mixture of shareholder expectations, marketing demands and, in some cases, ego, so that the notion of slashing the price to ignite demand is completely untenable. Should you buy the 2017s? Well, many had an appetite for both 2015 and 2016, two bona fide excellent growing seasons met with positive and laudatory reviews plus merchants willing to get behind the campaign, if not all the wines as they once did, but certainly a selective few. This is one critical change since I began covering Bordeaux. Release prices separate those whose interest extends no further than selling desired stock as far as négociants and those keen for their wine to flow through the chain to the end-consumer. The latter takes greater heed of market conditions and if priced correctly, finds the distribution system solidly behind their release because at every stage, somebody is making a profit. And that includes the end-consumer. Those priced incorrectly are now ignored by merchants. They no longer care about securing next year’s allocation, something for that buffer, the Bordeaux négociants to worry about as they need to maintain relationships with châteaux. I am privy to merchants’ actual sales to consumers and it is black and white, successful or disastrous, often hundreds of cases or zero. And I repeat something I have written several times: there is no such thing as a vintage that cannot sell. It just means the price is wrong for consumers. The Bordelais must understand that 2017 is going to be a tough sell following from 2015 and 2016. They should not take that personally. Nobody is denying that many estates go to extraordinary lengths to create what they feel is the finest wine possible. Don’t conflate Bordeaux bashing with criticism. The truth is that 2017 does not deliver the “buy it or miss out” quality of the previous two vintages. There are tales of heroics given those that were severely affected by frost and yet that is irrelevant to savvy consumers who say “yes” or “no” according to price and quality. Perhaps the big names will wait until after Vinexpo in Hong Kong that might give them a chance to judge the sentiment in the Far East? Yes, I did see Chinese people visiting châteaux during primeur but then again, I also met one group of six of which only one person is actually engaged in the wine business. So, take any attendance figures with a pinch of salt. The reality is there is little correlation between attendance and primeur sales. We shall see in the coming weeks how it will play out. It is a vintage that I have enjoyed tasting at this early stage. I like the style of the wines. There are many positive developments. Whether I choose to buy what I’ve tasted? That is a different matter.